In response to the 1988 shoot down of Iran Air Flight 655 by the USS Vincennes, the DoD was developing a missile can discern from a hostile target and a civilian airliner. W-105 was filled with US Navy vessels guarding “Neutral Vessels” when a target drone was launched and controlled by a P-3 Orion and headed to the coast. The missile being tested was fired from the USS Seawolf (SNN21). The Navy’s newest SNN was participating even though it had not been commissioned yet. It would be commissioned a year later. The Seawolf’s Cooperative Engagement Capability, which linked its weapon systems with the Aegis radar systems installed on other Navy ships participating in the exercise. Once the subsurface missile was launched, the Seawolf’s combat software no longer had control over the missile. Witnesses saw the missile searching for a target. When it ignored the target and homed in on TWA800 a second missile was fired to intercept the first. 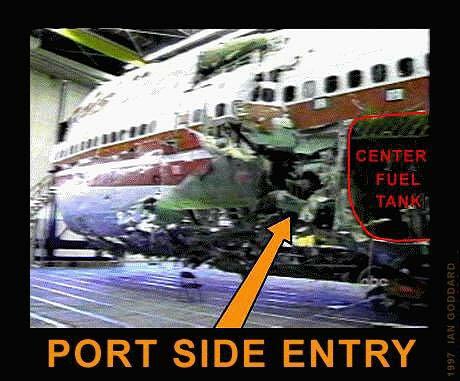 The second missile did intercept the first but exploded inside of TWA800. The two explosions witnessed were nine tenths of a second apart. The second detonation exploded the fuel inside of the center fuel tank resulting in the massive fireball. The fireball that the CIA as TWA800 climbing was the fireball of the test missile disintegrating. The “Highest Levels of Government” was Hillary Clinton, protecting her husband’s re-election. According to the former Navy official, the missile test was so important for the Clinton administration, it was being shown live on a Navy closed-circuit television feed at the White House. The Attorney General declared the wreakage a “crime scene and required the NTSB to relinquish control of the investigation to the FBI. The FBI removed evidence and altered wreckage with impunity and without notifying the NTSB. Two FBI agents were caught by airport security sneaking evidence from the hangar in the early morning hours. James E. Hall was a Clinton Arkansas Crony and was the Chairman of the NTSB. The Washington Post said his only qualifications for the position was his driver’s license. Jim Sanders and TWA employee Liz Sanders were arrested by the FBI and convicted of stealing evidence. The evidence was snips of passenger seat covers with missile fuel residue. Two U.S. Navy salvage ships, the USS Grasp and USS Grapple, were sent to Long Island waters to recover TWA wreckage. The green area was searched by the US Navy and all debris was turned over to the NTSB. The red area was searched by Navy SEAL divers and none of the debris recovered was turned over to the NTSB. The yellow area was searched by both teams and it was here that the “Black Box” recorder found. SEAL’s have come forward stating that their mission was to remove any missile parts found. Callahan, Maureen, (2016),“Was TWA Flight 800’s fiery crash part of a massive cover-up?” New York Post.